I often say in my profiles that I am a corporate gal by day and a blogger nights and weekends. So when I read the About Me section of blogging friend Nadeen of The Sophisticated Life was thoroughly surprised to see that this travel blogger with style is a pediatrician! Her opening line, “blogger by day, physician by night” brought a huge smile to my face…I love Nadeen’s flair! 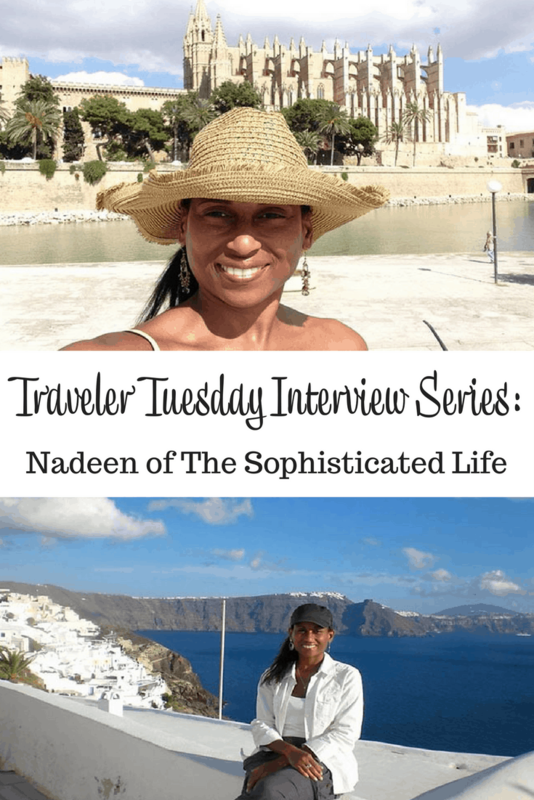 I met Nadeen online a few months ago and speedily gravitated to her blog because not only is she a foodie and goes to lots of amazing events, some of her favorite travel spots – like Spain – are my fav too. 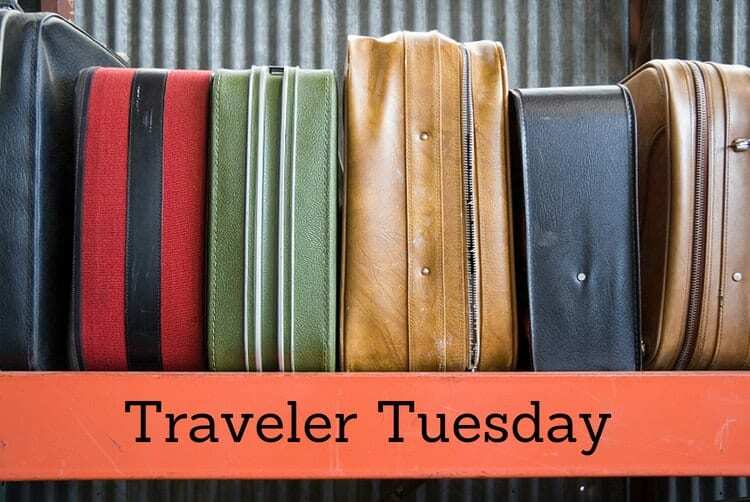 She has a fun jetsetter roundup that she publishes every month. I participated in January’s and plan to show my face a few more times throughout the year. The story goes that I took for first trip via plane from NYC where I was born to Jamaica WI where my extended family lived. Living in Jamaica until I was 10 we often took trips to NYC and Florida. While growing up I watched my Mother travel around the World coming back with magnificent stories. She was truly my travel inspiration and I wrote a blog post about her here. Adventure, Fun, Food, Culture, People, History, Relaxation. People are surprised to hear that although I love to travel I do NOT like to fly! I had a few bad experiences which left lasting impressions on me. However, I refuse to not see the world. And since you can’t get overseas or many places quickly by train or car, my favorite mode of transportation is still via airplane. Try my best to sleep so the time goes by faster. I also read books on my kindle or iPad and listen to music. If it is a long flight I often read about the place I am visiting and plan out my itinerary. This is a tough choice. It is probably a tie between Spain and Greece. You will often hear me tell people that I did not have a bad meal in Spain. I went into the most random, casual places and had the best tapas and paella of my life! In Greece the food was so fresh! Fish literally caught from the Aegean Sea, grilled to your liking then filleted on your plate! Choose to write about what you are passionate about. Do not pick a category or blog theme based on what is trendy or popular. There are a lot of aspects of blogging I did not know about and don’t really care for like the business or technical issues. However, what keeps me going is writing and sharing stories and pictures about my Travels and Food excursions, Wine Tasting and my love for The Arts. Since I will be getting married in the fall my international travel will slow down a bit until the end of the year, but I have several trips approaching in the US and back to Dominican Republic. First up is Disneyland in California! I am from the East Coast but a Cali girl at heart! I love exploring new and old areas and the last time I was in Los Angeles I discovered quite a few new things including Manhattan Beach. In March I will be back in the Miami Beach area where I lived for 8 years and it is the perfect place to visit in the winter. In April its back to Punta Cana in Dominican Republic! I stayed at the Hard Rock Hotel in December but in April I will be staying in the Now Larimar resort. In June it is a trip to Austin, Texas for the first time to pick up my first blogging award! 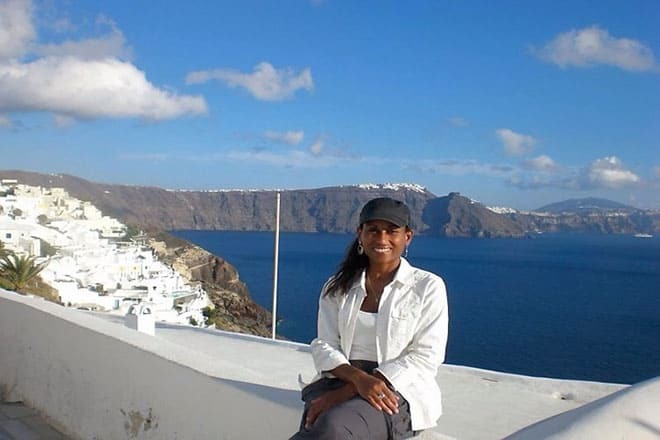 I am the winner of the 2014 Best Travel Blog in the the Black WeBlog Awards! You can keep all with all my travels on the Travel section of my website. You can keep up with Nadeen on Twitter, Facebook, Google+, Instagram, Youtube and Pinterest, as well as her blog. Wherever you catch her, I am sure you will enjoy her adventures! How about you? What would you like to know about Nadeen? I’d love to be able to taste Spanish and Greek cuisine! Mai-They are both so fresh and delicious! Hard to duplicate here in the states but I am always trying to find new restaurants for that same taste! @Mai, are there no Greek or Spanish restaurants in Finland? Lovely to meet Nadeen, Andi! That is a unique combination being a doctor and blogger, how fun! 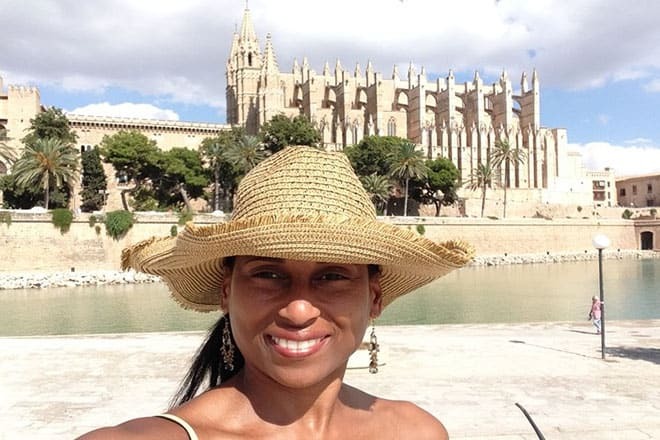 I have never been to Spain yet, but continue to hear so many good things about the country, culture and food, I just have to put it up on my list of places to go sooner than later! Thank you Christina! Doing both definitely keeps me busy! Spain is a must! I hope you get there soon! I love being introduced to great new bloggers – I’m heading over to Nadeen’s blog now! Sue Thank You!! I hope you enjoy it! I will check yours out as well! @Sue, me too, so glad you found Nadeen intriguing enough to visit her blog! Nadeen sounds like someone I would love hanging out with — a relaxed food lover! Congrats on your blogging award!! Thank you Katie! Yes I am definitely a foodie! @Katie, yeah, I am thinking she is on the approved travel companion list! Nancy-you will not be disappointed with either! So much history and culture and great food! Sounds like she has so many exciting adventures going on at the moment and so many to look forward to. Plus, an extremely talented woman. I love Spain too! The first chance I get, I’m asleep on the plane! I love taking books and magazines with me to pass the time too! Thank you Kaite! I love the “extremely talented” part-lol. I am glad you agree about Spain! I can’t wait to go back! Reading is a great way to pass the time while flying! @Katie, you lived in Spain as well. Got a favorite city? I lived in Madrid, but love Barcelona and I am dying to get to Bilbao. I’ve only traveled via plane twice to different states. Both experiences went alright for me. It’s a lot like riding roller coasters, except it’s not as scary going down in a way. Adelynn- I do not like roller coasters either! What is funny is I love heights because of the beautiful views but getting up there is my problem! @Adelynn, I love that analogy! i love riding planes! but the part i hate is waiting at the airport and all the delays. we prefer driving from las vegas to los angeles.. bc by the time you count in all the time waiting at the airport, the time is about the same as driving! I agree that even short trips can end up being so long with travel time! I enjoy road trips as well! Thank you for the Manhattan Beach recommendation! I definitely hope to make it back there! BTW-I love your blog! I am a Cali girl at heart! @Esther, my hubby was just saying the same thing. He is thinking of going back to Valley of Fire soon, but this time driving! Beautiful Nadeen, How blessed you were to have a mother who inspired you to travel. Thank you Jen! She truly was amazing and is still an inspiration. I love everything about your blog, Andi! This was such a sweet interview. I love that she does not let her dislike for flying stop her from seeing the world—how inspiring! And I couldn’t agree more with her blog tips. Just because something is trendy to write about doesn’t mean you have to. People can feel the passion (or lack there of) in our posts. Why waste our time on something we don’t love? Love the interviews! Thanks again for sharing!! Charlotte-what great compliments! Thank you so much! I am glad you enjoy my blog! Overcoming fears is so important in living life to the fullest! And bloggin is such much fun when you write about what you love! @Charlotte, thank you! Nadeen is one smart lady and her advice is sage! Very interesting! I thought I was busy working full-time, and she’s a doctor too! Phew! Pretty impressive! Lol Cynthia! I know that most bloggers lead double lives and are always busy! @Cynthia, I know, I love that she calls herself a blogger first, seems to me a pediatrician is a pretty hefty job! Congrats on your feature Nadeen. Nadeen is truly my travel inspiration. Just seeing all her beautiful experiences makes me want to hop on the next plane to Europe! I look forward to her adventures and all the food and wine fun too. AWWW! Thank yoou MJ! You inspire me as well on your blog and being an awesome Mommy! I know you will enjoy traveling through Europe! @MJ, she is pretty amazing and I love seeing all the places she goes as well as her blog hop friends! Congrats on her awards! I liked what she had to say about not just blogging about what is popular. I think it’s easy to fall into that trap. Thank you Angie! And I am glad you agree about blogging! @Angie, it is so easy to go with the trends, definitely far more interesting to blog about what you love, find your own tribe and be original! So nice to meet you, Nadeen! How do you have time to travel as a pediatrician?! Congrats on your engagement and your exciting award! Lois-Thank You! It has been a busy year! lol! Fortunatley I do twelve hour shifts so scheduling travel time is not too difficult vs if it was Monday throu Friday 9-5. What a lucky woman! And I agree with her about Greece – whenever we are away from our second home there we are always counging the days until we can cook with fresh Greek ingredients! @MD, what is your favorite Greek food to make? I love Greece! This is such a fun series, thanks for sharing! Katie isn’t it amazing?! Thi sis a fun series and I am honored to be a part of it! @Katie, so glad you enjoy it! I love meeting new bloggers, particularly travel bloggers, they bring their discoveries from every part of the world into our homes. This was an awesome post! Thank you for sharing. I would love to go to Greece. Thanks for commenting Lisa! Greece is definitely worth thr trip! @Lisa, Greece does look pretty amazing! Would you want to go to Athens or the Greek Islands? So very nice to meet Nadeen and I love the pics! I’m so impressed with the entire post! I wish I had the gumption to travel more frequently. Your posts are so inspiring and beautiful. Thanks for sharing them! Carolann-Thank you! Andi does profile great travelers and I am so happy to be included! I hope you get to travel more soon if it is something you desire! @Carolann, I am so glad you enjoyed the post! I love interviewing other blogger to learn more about them and I am happy you do as well. Krystel is absolutley is! There is a big difference betwen Athens, the mainland and the Greek Isles but they all offer something special! 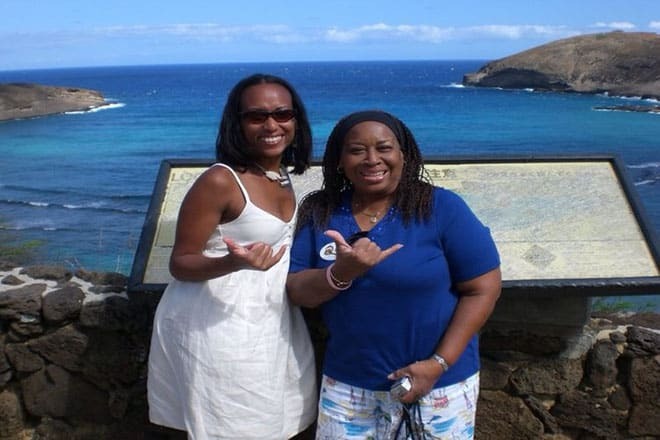 @Krystel, I haven’t been myself, my hubby has several times and every time I see photos I want to plan a trip! I’m such a huge fan of Nadeen and her blog, and like you, I’m so impressed that she juggles blogging and being a pediatrician. I have yet to make it to Spain or Greece, but I’m really looking forward to the food in both places. I often find myself drooling over Nadeen’s food pics in my Instagram feed! 😉 Thanks for sharing this interview, Andi! @Dana, so glad to hear from a friend of Nadeen’s. She is so inspiring and I love her commitment to life – she is definitely ALL in!